You will be asked to complete a comprehensive medical questionnaire designed by our doctors to see if the treatment selected is suitable for your condition and needs. You will be asked to create an account with us prior to this to allow us to build a patient history for the doctor to make a safe and informed decision on your treatment. Our doctors will review your consultation and may contact you via e-mail or telephone if they require any further information or clarification. If your prescription request is approved our doctors will e-mail your prescription to our UK based pharmacy for dispensing. 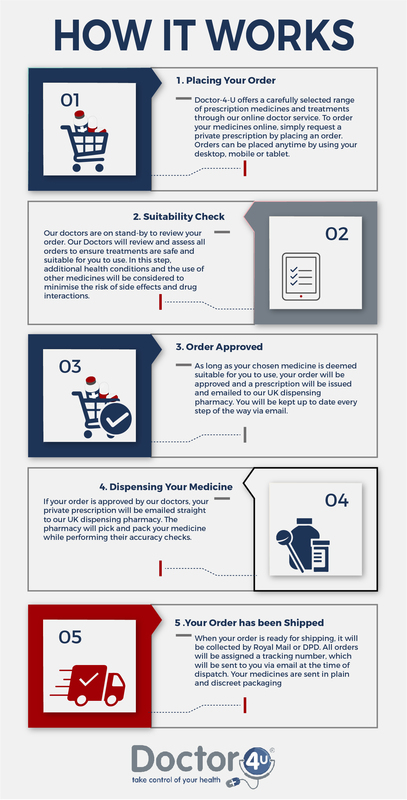 Upon receiving your e-mail prescription, the UK Pharmacy Innox Trading ltd. will dispense your medication, have final checks done by the lead pharmacist and post via fully tracked delivery to your home or work place. All parcels are sent in discreet confidential packaging. It is really important that you give up to date medical information each time you order. If your condition changes please let us know. We also advise regular check-ups with your own local GP. to monitor your condition and treatments used. If you do not have a local GP or want to locate services in your area, please follow the link below and enter your postcode. You can contact [email protected] at any time to ask a doctor or a pharmacist a question about your treatment or condition. Please note Doctor-4-U should not replace your regular GP who you should keep updated about your treatment at all times. By using this website you agree to your data being shared between Med Connections, the prescribing doctor and the dispensing pharmacy. Doctor-4-U will never share your personal details or health history except with the dispensing pharmacy and prescribing doctors. Please see our policy, for details CLICK HERE.